The blue mold fungus produces spores that are the result of both sexual and vegetative reproduction. 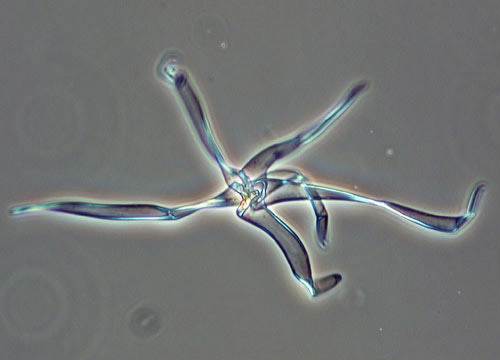 Resting spores, or oospores, are produced through sexual reproduction and are believed to be involved with long-term survival of the species. 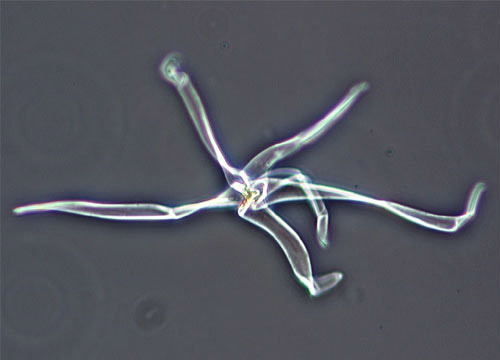 Sporangiospores are produced vegetatively as the mold, in essence, makes clones of itself. Sporangiospores can develop by the millions within hours after a tobacco plant is infected, intensifying the need for quick action by farmers who want to save their crops. Blue mold is highly weather-sensitive, yet genetically resilient. During intervals of cool, wet, and overcast weather the disease develops and spreads swiftly. In recent years, biologists have begun using meteorological tools to track clouds of these spores traveling on the wind over the Caribbean Sea, Latin America, the continental United States, and Canada. This information is used to predict outbreaks of blue mold, giving tobacco growers an opportunity to protect and treat their crops. Blue mold, however, has proven to be extremely adaptable. New strains of the fungus appear rapidly following release of resistant tobacco varieties and new fungicides.